Samadhi Yogashala & Wellness Center is Siem Reap’s most inspiring place for yoga, wellness and community gatherings. We feature two yoga studios and a spa & wellness center where guests can experience top quality yoga classes in a variety of styles, first-rate facilities and exceptional services in the most inviting environment. Our main yoga studio can accommodate up to 30 students, and a smaller one which can accommodate up to 15 guests. Each of our yoga classes (75 min) is designed to help you get your pose on, improve your balance and help you reap the amazing benefits of yoga. Guests joining any session get free access to our three swimming pools, restaurant and gym. Our wellness center; on the other hand, consists of a tropical spa that features organic scrubs as well as traditional Asian massages and a healing atelier for acupuncture, cupping, shiatsu and mind-body healing sessions. Samadhi Yogashala & Wellness Center is located within Navutu Dreams, Siem Reap’s only upscale, eco-chic resort & wellness retreat. Love the yoga classes at this yoga studio & wellness center in Siem Reap. The yoga studios are huge and well-equipped and yogis can also have access to three pools and gym before or after the class. Those who want to balance their chakras or receive an acupuncture/cupping treatment may opt for their holistic healing services readily available in one of their healing rooms, administered by their resident healers and Traditional Chinese Medicine experts. The top wellness center in Siem Reap when it comes to facilities, detox programs and services for holistic healing. I opted for a 1 day gentle fast which included health diagnostic, body-work, yoga, organic meals and some drinks to flush out the toxins. The program also included an acupuncture treatment with Francois, who is a certified TCM practitioner. I felt really cleansed and recharged after the program. It may be just a one day wellness program but it was more than enough to help me relax and reset. 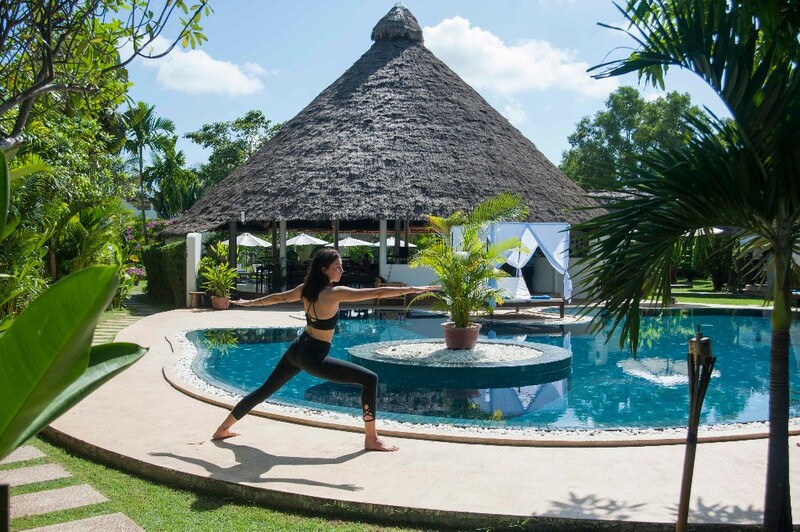 The facilities are top-notch as well, from fully-equipped yoga studios, healing rooms to their three pools and gym – all in a beautiful tropical garden setting.